I spoke too soon about the TFF reset curing the problem. The problem persists and is triggered by deleting recent history: see attached pic. The HDD then begins intense activity and TFF will not quit (non responsive) and must be force quit. Upon restarting TFF the HDD activity sporadically happens. The TFF reset cures the problem until deleting history. Ten Four fox in the latest PPC stable release (and the current Beta) is causing constant HDD activity (it sounds like data crawling). When TenFourFox is quit the application stops responding and I have to Force quit the application. The HDD activity continues until TenFourFos is forced to quit. Does this occur on some sites, or just doing nothing? If the latter, no such issue was reported during the beta test, and I haven't observed anything like that in any of the test machines which I use on a daily basis. I'd look in Activity Monitor and see if it's TenFourFox that's actually doing it. If not, that would be the app to investigate. If it is, a corrupt cache might do something like that, and I'd start off by trying to reset your profile (see link at lower right). I could not pick up a detectable cause of the HDD activity, but it was intense and persistent once started. TFF was absolutely the cause (as the HDD activity quite when TFF was forced to quit). The TFF refresh you recommended seems to have cured the problem. Thank you. Cameron Kaiser closed this discussion on Oct 27, 2016 @ 12:01 PM. 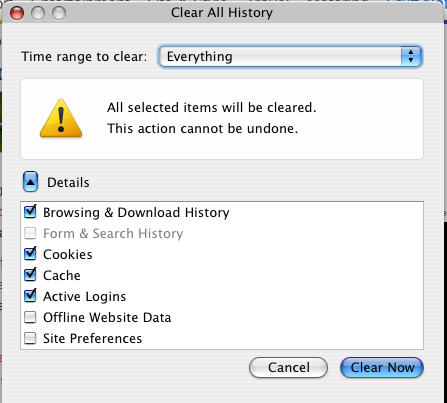 Clearing history can take several minutes (the browser is unresponsive) if there's several months of browsing history. Please don't open new threads to follow-up old problems. What Chris said. The process can be quite slow for heavily used profiles. The fact resetting your profile fixed it (temporarily) indicates you do have a lot of activity for the browser to go through. If you'd prefer not to wait, you could try exporting your bookmarks and then trashing your profile entirely, then reimporting your bookmarks. This is essentially what the second set of steps under "How to reset your profile" does.